2K today announced the release of physical copies of NBA 2K Playgrounds 2 on Nintendo Switch™, at a retail price of $29.99. This two-on-two arcade basketball game from developer Saber Interactive and 2K features many ways to play on your own, with friends or against the world, with NBA stars such as Karl-Anthony Towns and Jayson Tatum and all-time greats including Kobe Bryant and Michael Jordan. 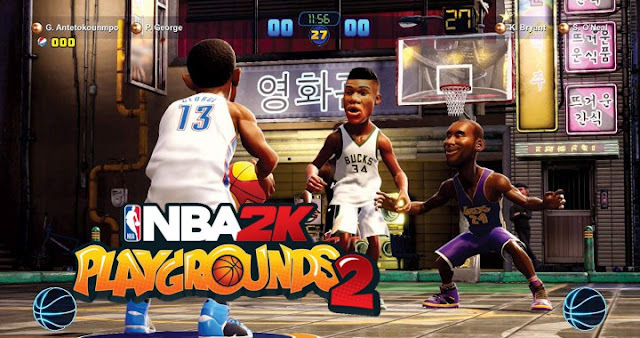 NBA 2K Playgrounds 2 is also available on the PlayStation®4 computer entertainment system, Xbox One and Windows PC. NBA 2K Playgrounds 2 is fun-packed with over 300 players and ten exciting playgrounds from around the world, including Australia, Washington, D.C., and St. Louis, with even more players and courts to be added after launch. In addition, the game boasts well over 100 signature moves, with showstoppers like LeBron James’ self alley-oop, and George Gervin’s Iceman finger roll! New player customizations are also available, including shoes, jackets and shirts, along with a licensed soundtrack featuring popular artists such as DJ Premier and Run The Jewels. For the latest updates from NBA 2K Playgrounds 2, visit https://nba.2k.com/playgrounds/, and follow the series on Facebook, Twitter and Instagram. NBA 2K Playgrounds 2 is rated E (Everyone) by the ESRB.